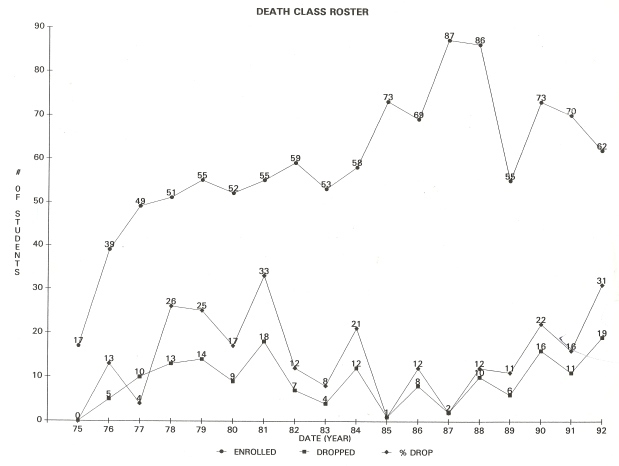 In February 1993 I welcomed students to the spring semester course known as Death Education. The students were intently staring, waiting to discover what makes a course like this become so popular in our high school. That was the 19th year of the class, and was open to any high school student, although Seniors usually made up the majority of the class. The course began in 1975 on a complete whim. For the student it looked like a cracker-jack course - no homework, no tests, and no quizzes. The course started because a few students had nothing to do after the first semester class Oceanography ended. A few, out of habit, came to my room to chat and eat their lunch during my newly acquired free period. One suggested that I teach another course. Not really wanting to give up a free period I was not that enthusiastic until one student suggested I teach a course on death. A bell-note sounded in my brain. They were told that if 10 kids could be rounded up and would agree to come every day until school recessed in June, I would do the research on the subject and teach it. One kid returned from the cafeteria with 17 candidates and they became the members of first Death Education class. Thousands of minutes were about to be spent talking about a subject that is taboo in America. People often ask, "What does one teach in Death Education?" The answer is everything. Having little experience in the field forced me to gather as many death books as I could find and then use those topics as a course outline. The only problem was being sure of what was being taught. Was this fantastic voyage I was undertaking the correct course? I knew I had to call in the professionals, aptly nicknamed, "the death ministers", in order to legitimize the content. Have you ever decided to call a coroner and ask him to come to talk to a class of high school students about his job? I was amazed at the reactions. Not only did the "death ministers" want to come in - the police, funeral directors, rescue squad personnel, the dying, medical doctors, crematorium operators, cemeterians, lawyers, clergy, apparition spotters, and morgue personnel - and tell the kids about their work, most returned year after year for repeated performances with each new class. Some welcomed us to visit their businesses. They all were willing to take time from their jobs to provide this free service. Of all the classes I ever taught, Death Education was the most satisfying and produced the most lasting communication from students. Letters of thanks and praise have been received over the years. It has been truly satisfying. The one initial fear that was quite concerning in 1975 was that a student would commit suicide while enrolled and the course would be blamed as the responsible agent. That would have been devastating to me, the school, and the course. Fortunately, the opposite happened. Several letters from potentially suicidal students stated how the course led them to learn to live and enjoy life. Plotting the enrollment verses the number of dropouts over the 20 years produced the following graph. As the class grew from the original 17 it recorded a high population of 87. Following that year the decline was the result of New York State passing the Regents Action Plan. Kids were required to take more courses for graduation leaving less room for electives. There was a large decline in 1993 due to a period change which conflicted with other courses the students were required to take. It is interesting to note what the motivation was for a kid to decide to take Death Education. Common answers included the good reputation the course had in the school, the desire to go into mortuary science, it was an easy half-credit, the desire to learn more about the subject, some were required to take 5 classes, and some wanted answers as to why death makes us feel the way we do.